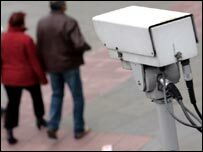 Up to 500,000 CCTV cameras could be used as part of a highly sophisticated plan to police the 2012 Olympics. The Metropolitan Police (Met) force wants to pool its 10,000 cameras with traffic and congestion cameras across the city, BBC London has learnt. The network would be operated from a command centre, in London, by military, police and intelligence services. The force said it was looking at how various CCTV networks could be used but that planning was at an early stage. Earlier this week Olympic security coordinator, assistant commissioner Tarique Ghaffur, gave an update on the security planning he envisaged for the 2012 Games. He said: "Efforts focus on the capabilities we currently have and how these can be used efficiently to make London safer both now and during Games time. "A good example of this is how the current capabilities of various CCTV networks might be harnessed and integrated in London within the current legislative framework, to deliver greater effect in mitigating specific threats as part of the Olympic security effort." It is understood the command centre would remain in place after the Olympics. Dee Doocey, London Assembly member, said it was important to be clear that CCTV cameras were not a substitute for officers. "We must do everything possible to ensure both athletes and those attending the games are safe and CCTV (cameras) undoubtedly play a key role, but they are a tool, they are certainly not a substitute for police officers."